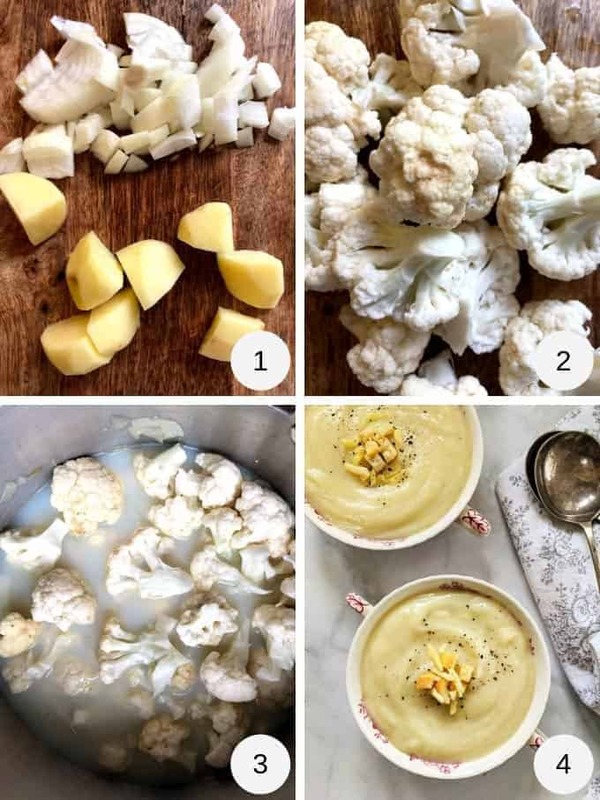 This simple and tasty Cauliflower Cheese Soup is just 3 SmartPoints per portion on Weight Watchers Freestyle plan. 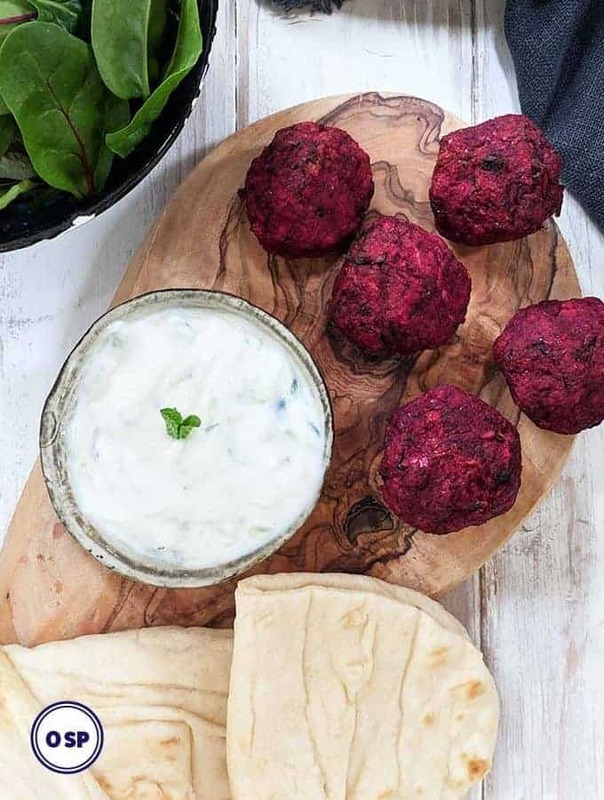 It’s simple to make, it’s filling, satisfying and a perfect warming lunch for those cold winter days. The soup is thickened with a little potato and is packed full of cauliflower, a great source of Vitamin C.
If, like me, you find soup an easy low SmartPoint lunch, you may be interested in this Hearty Chicken Noodle Soup or perhaps this Carrot & Coriander Soup. This Pea Soup is also very popular and it’s only 1 SmartPoint per bowl. 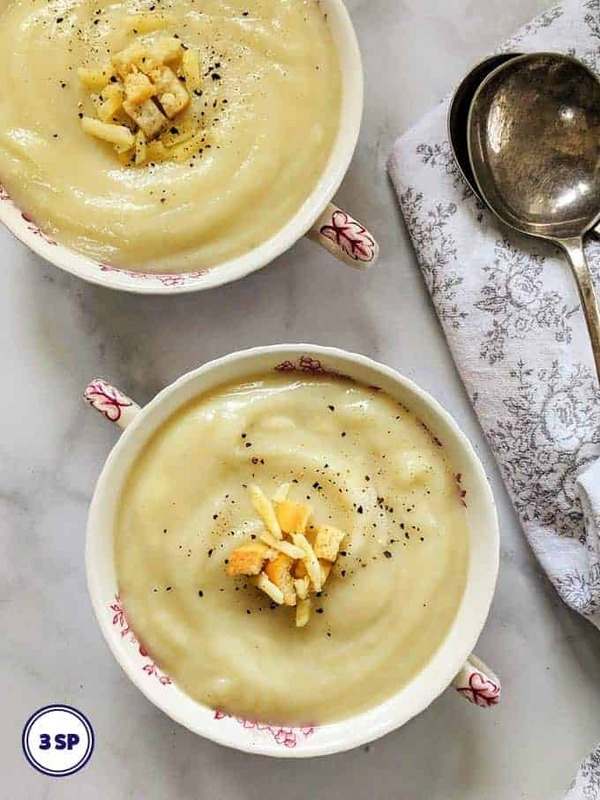 If you like cauliflower cheese, you will love this Cauliflower Cheese Soup! It is creamy and thick with a delicious tang of mature cheddar cheese. 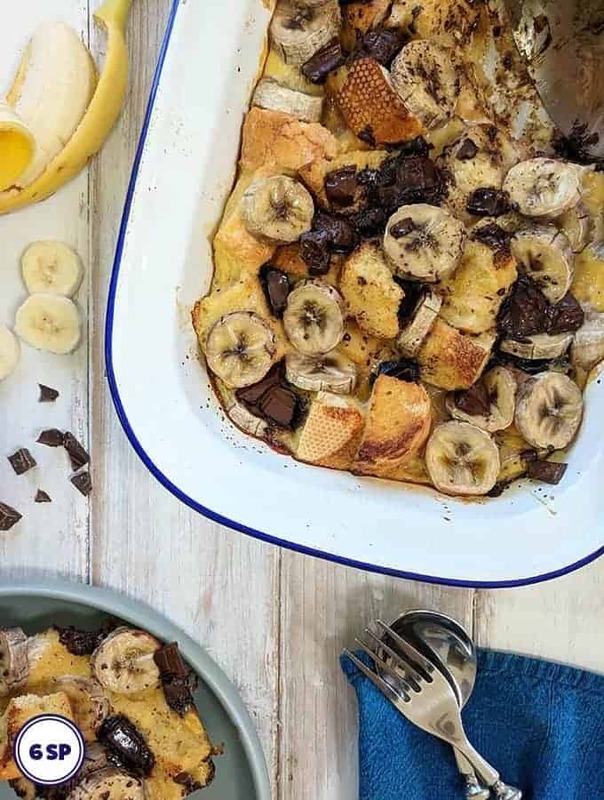 By using a low fat mature cheddar cheese in this recipe you can use less cheese for a good, strong cheesy flavour, with relatively few SmartPoints. I mixed 40g (approx 1/3 cup) of low fat grated mature cheddar cheese into the soup. This worked out at 3 SmartPoints for the cheese. WW own brand low fat grated mature cheddar cheese works out as 2 SmartPoints for 40g. However, not all low fat mature cheddar cheese works out as little as 2 or 3 SmartPoints per 40g. Just beware of this when choosing which cheese to use and alter the SmartPoint values accordingly. In addition to sprinkling a pinch of grated cheese on the top of this soup before serving, I also added a couple of croutons for a bit of crunch. Ten grams of the Valledoro mini croutons which I used worked out at 1 SmartPoint and for that you got 12 croutons! Quite enough crouton to give a bit of added crunch to this tasty soup! 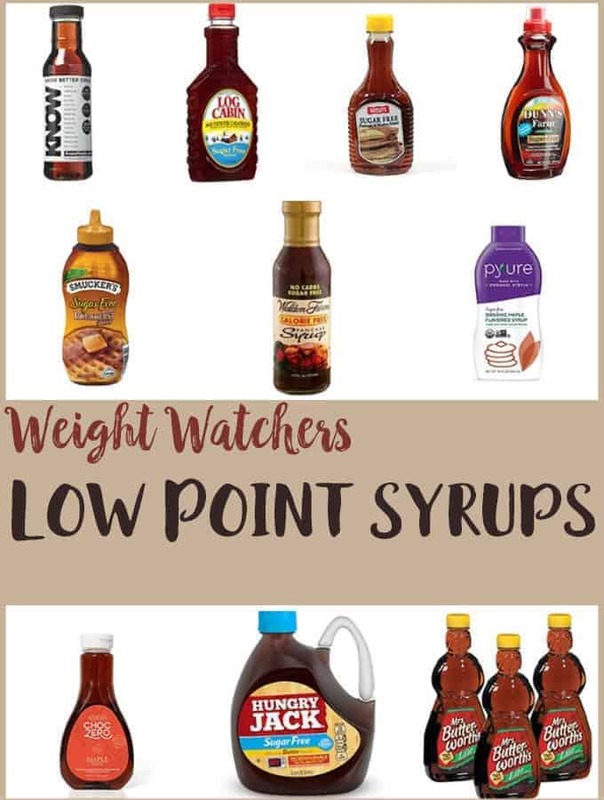 Alternatively, you may like one of these Low Point Breads (USA) / Low Smart Point Breads (UK) for dunking in your soup! This soup is just so easy to make. Chop the onion and potato into small pieces (Picture 1). Remove the outer leaves from the cauliflower and remove the stalk. Remove the florets from the inner stalk and wash them thoroughly (Picture 2). Heat the oil in a large saucepan and fry off the onion until soft. Add the, chopped potato, cauliflower florets, stock, seasoning and milk to a big pan (Picture 3). Bring to the boil, reduce the heat before simmering (covered) for 30 minutes or until the cauliflower and potato are soft. Use an immersion hand blender to blend the soup till it is smooth and creamy. Alternatively, you could put the soup, in batches, through a blender for a really smooth soup! Add the grated mature cheddar cheese to the blended soup and stir till the cheese melts. Serve with a couple of croutons on top and a pinch of grated low fat mature cheddar cheese. I use a hand held immersion blender, like this one available from Amazon, to blend the soup. I used some of these Valledoro Crostini (available from the Co-op in the UK) to sprinkle on top of the soup. Ten grams of crostini worked out at 1 SmartPoint. 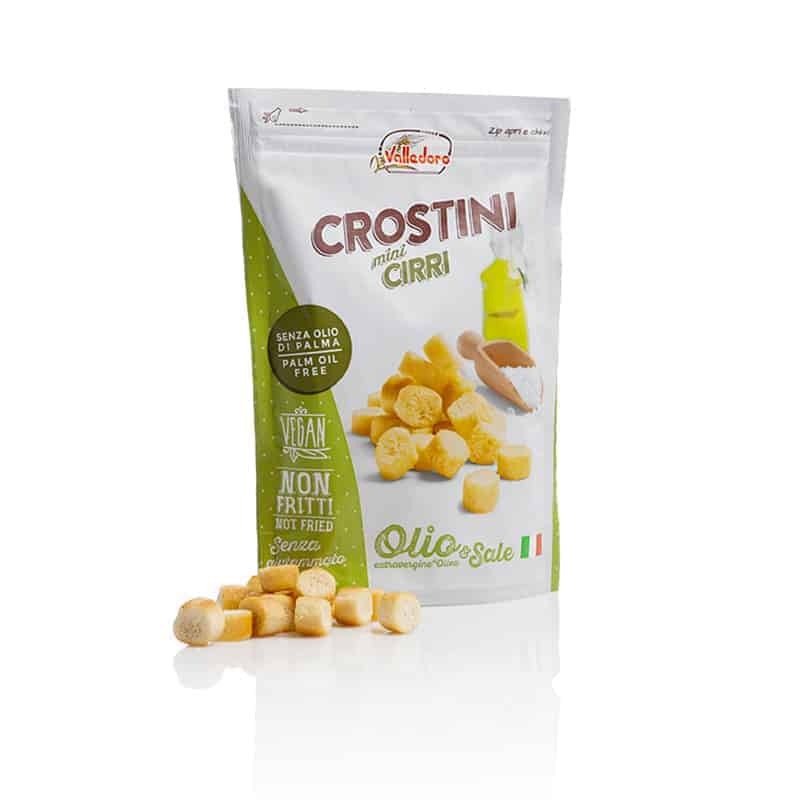 Alternatively, you could use Olive Garden Seasoned Croutons, available from Amazon, which work out at 1 SmartPoint per 7g / 2 tablespoon serving. 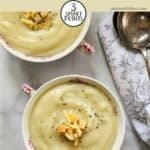 Can I freeze Cauliflower Cheese Soup? Yes! Freeze this soup in a suitable container for up to 1 month. 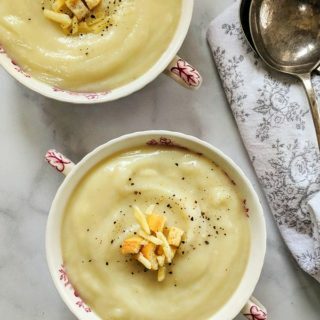 This tasty & warming Cauliflower Cheese Soup is just 3 SmartPoints per portion on Weight Watchers Freestyle plan. Heat the oil in a large saucepan. Add the chopped onion and saute for 5 mins or so until it has softened. Add the cauliflower, potato, stock, milk and some salt and pepper. Bring the mixture to the boil and then reduce to a simmer. Place the lid on the pan and simmer for 30 minutes until the cauliflower and potato are soft. Remove from the heat. Use a hand held immersion blender to blend into a smooth soup. Stir in the grated cheese until melted. Taste and add more seasoning if desired. Serve topped with a few croutons and a pinch of grated cheese (optional).